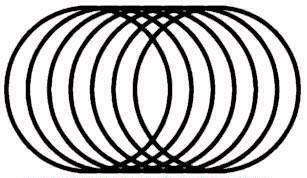 This is an optical illusion of a coiled wire cylinder that looks a bit like a slinky, the popular toy that can walk down stairs by itself. The orientation of the coil changes depending on which way you look at it, can you tell if it is angled towards the left or if it is angled towards the right ? ITS GOING TO THE RIGHT! I cannot stop laughing at some of these comments! It is a left brain/right brain thing.